When Ann Pellagrini told us she was getting a group of people together to go white water rafting down the Deerfield River (a.k.a. “The Dryway”) in western Massachusetts, my friend Ed and I jumped at the chance. 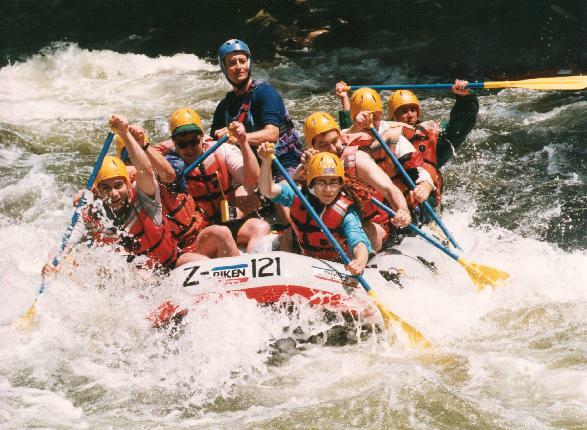 Ann managed to get together nine people and we all signed up with Zoar Outdoors for the rafting trip. The Deerfield River is a class 3/4 river. That means it has both class 3 rapids and class 4 rapids. 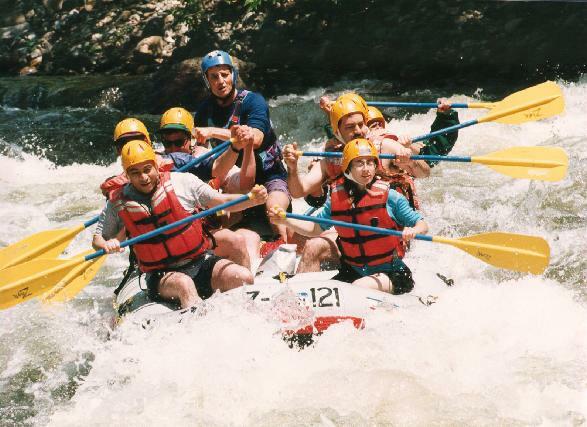 At the time I knew nothing about rafting. I mean the only time I had ever been was eleven years ago. But I had heard that class 5 rapids were really nasty. 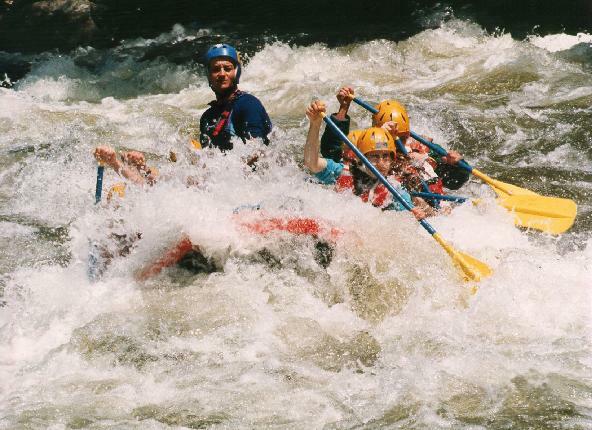 So here I am hearing that as a beginner I’d be going through class 4 rapids. Needless to say, I wasn’t too sure about how I’d manage. Sure, I obviously enjoy taking risks, but I also try not to take unnecessary risks. However, I figured Ann is a trained guide and she wouldn’t suggest a river that was too hard or too dangerous. Neither Ed nor I felt like driving 3 or 4 hours at dawn, so we split the cost of a motel room just a few miles from Zoar Outdoors. In the morning we went over and met up with everyone. It turned out that there were enough people to fill twelve rafts! (That’s six or seven rafters plus one guide for every raft.) By this time, I was getting anxious. I really wanted to be out on the raft plowing through the rapids! It turns out that the dam release we were supposed to ride was going to be a half hour later than we expected, so I had plenty of time to sit around and wait. Aargh. But finally we went and got our helmets, life vests, and paddles, and boarded the bus. Quite a while later we finally made it to the raft. Naturally since I wanted to see this white water as close as I could, and the nose of the boat was near the shore, I made sure I was last in line. I ended up in the right-front seat. Well, ok, it wasn’t really a seat. There aren’t any real seats in a white water raft. You sit on the side, hook your feet under an inflated cross-beam and pray you don’t fall in. Our guide instructed us on how to stay in the boat. Basically, lean over the water rather than lean in toward the middle of the boat! Boy, that made a lot of sense. (Please don’t drown in my sarcasm.) I thought that sounded nuts, but I’d behave and do what he said. The guide also told us that we would be the lead raft. That meant that we had to take care of the safety of all the rafts behind us. There was a short pause. “What about our safety,” went through my mind. He says, “of course, since we are the lead raft, there’s no one ahead of us to take care of our safety.” He told us that we’d just have to be careful, try not to fall in, and react quickly if someone did fall in. Ok, no big deal. We can handle it. Sure, I only really know one other person in the boat (my friend Ed, Ann and the rest were in another raft), but I figure we’re all adults, we all look fairly active and responsible, we’ll manage. Our guide took us through a few exercises as we started off in the calm water. Things like, “all forward,” “left back,” etc. We spun our raft around and around, shot it straight forward, backed it up, etc. We noticed another raft hung up on a rock and knocked them off by slamming straight into them. When we hit, the rock caught us for a couple of seconds, but we didn’t get hung up. Off we went toward the rapids. Being up in the front of the raft was interesting. It meant that I had to set the pace of the paddles on my side of the raft. It also meant that the person sitting next to me and I had to keep our strokes in time to keep everyone else in time. That wasn’t too hard, but it added just one more element I had to think about. I am glad I got to sit in the front. I was very interested to discover that our guide was telling the truth when he told us that the only way to stay in the raft was to lean out over the water. By leaning out, you can leverage your weight on your paddle and that keeps you in the raft. I am absolutely sure that some of those rapids would have tossed me right out of the raft if I didn’t have my paddle slamming into the water. Sitting up front was quite thrilling. It meant that at every rapid I went underwater. At almost every rapid I was being tossed around and desperately hanging onto my paddle. However, by following the instructions about leaning out over the water, I was only dislodged from my seat once. That time we went out over a dip in the river and when we hit I slid forward into the very front of the raft. I quickly jumped back into my post and everything was cool. Another time I had someone end up in my lap. Besides things like that, we didn’t have any incidents. No one fell out. No one lost a paddle. We didn’t get hung up on any rocks. We didn’t hit anything we didn’t mean to hit. (Occasionally our guide would have us aim toward some rocks just to slow us down.) I was quite surprised however, because we were the only raft that had a perfect record. Every other raft had “swimmers” and got hung up on rocks and hit things they didn’t mean to hit, and a few rafts lost paddles. I really have to thank our guide, he obviously knew his stuff. Another interesting thing about this trip were the kayaks. There were tons of them. Our guide warned us that they would “play chicken” with us and dodge out of the way at the last moment, but I was still a little surprised to see it. These guys seemed to think it was fun to watch one of these large rafts bearing down on them. At one point, we were aiming for shore after a rapid and a kayaker was in our way. Our guide suggested he move and he just glared at us. As we got closer his glare just hardened. Eventually, we bumped into him. He would have been fine if he had just pushed off and given one stroke of his paddle to get out of our way. Unfortunately, he felt like being a jerk and grabbed hold of the rope on the front of our raft. Of course, since we were traveling forward and his kayak was facing sideways, he tipped over and we rode right over him. He managed to right his kayak and started swearing at our guide. Since he was the one being a jerk, everyone on the river started razing him about being so sour. An hour later, much further down the river, he was still swearing at us, people on the river were still razing him, and even the other kayakers were teasing him. Well, I guess there is one in every crowd. At another point on the river, we watched a kayaker turn over in a rapid. She managed to get out of her kayak, but it went sailing down the river as she was scrambling for the shore. I’m sure someone found her kayak and beached it for her, but still, I can’t imagine losing my boat halfway down a white river… We all felt bad for her. At the end of the trip, we got to have a short swim in some very minor rapids. It was pretty cool (I love all forms of swimming), but also pretty tame. Overall, it was a very exciting trip. I really enjoyed it. However, I would probably want to experience class 5 rapids next time. Even the class 4 rapids seemed calmer than I had expected. I think a class 3/4 river is perfect for beginners such as me, but class 5 rapids would be better next time.